A scavenger hunt through Memory Lane. Explore the world in a whole new way. 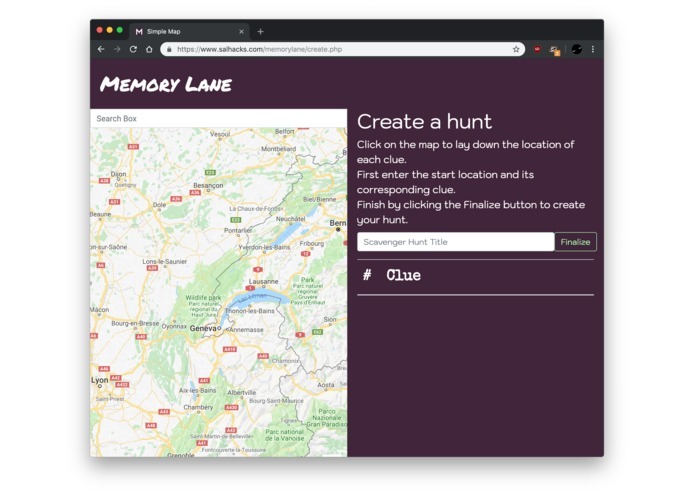 We set out to design an application to not only capture the nostalgia of certain landmarks, but to allow users to record a journey through Memory Lane. Memory Lane was designed with the idea of being able to relive memorable journeys. It slowly became more than this as we expanded on the idea of including scavenger hunts for any occasion. A creator would be able to design a scavenger hunt via a Google Maps interface and provide clues for a follower to discover these locations. Memory Lane was built to be a web application though it is very much mobile friendly. The creator page was designed to be user-friendly. Since many people are familiar with Google Maps, we utilized their API to create a plottable path which would represent the Scavenger Hunt path. The HTML5 Geolocation API was used in order to have an accurate bearing on the user's current location. We ran into several UI issues when it came to designing a the creator interface. The creator interface had to include Google Maps and some space for users to be able to write out their clues. The difficulty came when designing this to be both spacious and mobile friendly. 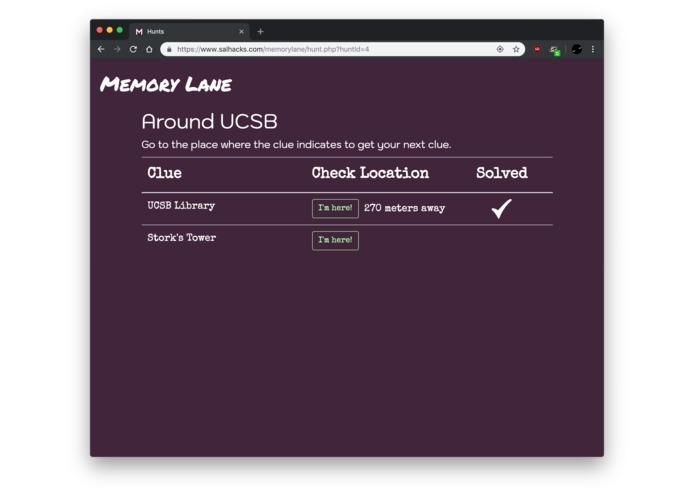 We were not very experienced in Bootstrap's implementation of flexbox, however, we determined it to be a necessary element in designing our interface for creating the scavenger hunts in particular. We are incredibly happy with how clear our user interface came out, especially with how many different elements we had to implement. We became more familiarized with some of the more advanced aspects of the Bootstrap framework, especially in the usage of flexbox, as well as learned how to implement the Google maps API. We intend on making the experience of progressing through and ultimately completing a scavenger hunt more rewarding for the user. Additionally, we plan on recording more statistics in a user's scores and history, for example how long the average user takes to solve for a landmark and the total number of users that have completed a particular scavenger hunt.